Pet Wants SpringfieldMO: Do You Have a Dominant or Submissive Dog? Do You Have a Dominant or Submissive Dog? Like people, dogs have a variety of personality traits. You can easily tell if your dog is outgoing and playful or quiet and reserved. Whether your dog is a dominant or submissive animal, however, can be harder to ascertain if you don't know what specific behaviors mean. By observing the interactions that occur between groups of dogs, you will get a better sense of where your pet falls in the pack hierarchy. This knowledge doesn't just serve as an interesting conversation piece between dog lovers. It can also help guide you on the best ways to train and interact with your companion at home. Just because your dog runs up to people to greet them or will play with any animal doesn't signify that it has a dominant personality. Dominant dogs are the animals who set the tone of the pack, deciding which behaviors are appropriate. They will be the ones who are allowed priority access to food, water, toys and attention by the other dogs. 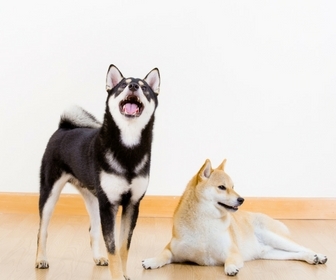 Behaviors exhibited by a dominant dog include staring, mounting, pushing to the front of the group, posturing over another dog, taking away toys or food and always winning tug of war games. It is important to remember that dog packs are fluid. If there are different dogs in a group on Monday than there were on Sunday, the power may shift, and a different dog could emerge as the alpha leader. However, truly dominant dogs will always retain a higher status in a pack. It's rare to have a very submissive animal suddenly become a leader by adding or taking away dogs. Which is Easier to Own? You will find dogs who are naturally submissive to be more inclined to respect the authority of their human pack leaders. This does not mean they will be 100% obedient or that they don't need hard work put into their training. It simply means that they are more likely to recognize that you are in charge. Dominant dogs can make great pets, too, but will require that you to learn how to exude an air of confidence and authority. Remember, at the end of the day, whether your dog is dominant or submissive, in your home, you are the leader. Since great power comes with great responsibility, be sure to continue educating yourself on how to be the best dog owner possible.